We have significantly reduced the price of our beaded jewellery to wipe out the competition. You can now buy exclusive beaded jewellery at wholesale prices. Amazingly LOW prices and exceptional quality this is our goal !! Bracelets for formal and casual wear. Made from very high quality Chinese beads, available in 4 colours. Beaded and Sequence necklace. Available in 4 colours. Y Necklace red antique look to it. Blue beaded necklace decorated with a heart pendant. 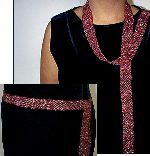 Black or Red beaded necklace with a square pendant. Beaded blue and black strands to form an elegant necklace.